Up to mid-November the weather had been kind to local wild bird populations. I was very pleased with the numbers of Kestrels appearing in a relatively small rural area between Broadway and Evesham. Dawn observations can be very revealing and at this time I was seeing four Kestrels between Childswickham and Hinton Cross, four at Wickhamford and four at Broadway. Typically as winter draws on Kestrels start hunting ever closer to human habitation, examples being one bird regularly returning into Broadway village centre and another frequenting a Wickhamford garden centre. 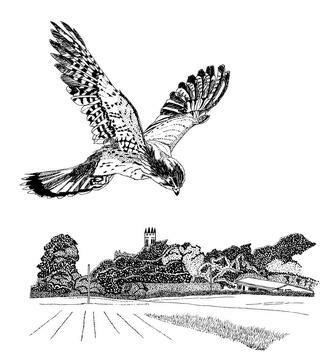 On 30th January 2006, the Broadway bird flew over me at 07.40 hrs and actually alighted on the chimney stack of a nearby house. Through my eyes this has not been a typical type of perch to see Kestrels using. My Broadway subject normally utilized a telegraph pole over-looking gardens and an alley-way. A return journey from Pershore to Stratford-upon-Avon yielded no less than nineteen Kestrel sightings (C.E.Turner) and six Kestrels were on view between Pershore and Hill and Moor Landfill Site on 5th December. A beautiful sunny winter’s day on 10th December brought the raptors out on view. All three common raptors showed well around the Vale and the Kestrel count was typically good, defying general opinion that their numbers are declining. One of the day’s highlights was a count of five Kestrels spaced out along the route between Hinton Crossroads and the Bricklehampton turn off, a distance of approximately 5½ km. The evening of 28th February 2006 was destined to be spectacularly successful for recording predatory birds in our part of south east Worcestershire. Beginning with my journey home from Broadway to Pershore on one of the lightest evenings to date, produced a fabulous hunting Barn Owl quartering a rough field near Little Comberton. This coincides with Barn Owl sightings seemingly coming out of the woodwork around the region, also confirmed by Harry Green. 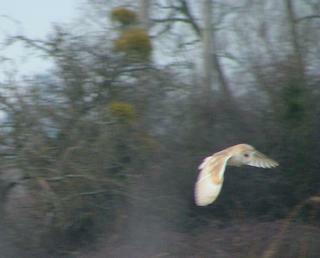 Only recently on 20th February had I seen a Barn Owl hunting along the Tewkesbury Road verge at Bredons Norton after 21:00 hrs. It seems the Barn Owl is making a determined effort to return to these parts the likes of which I have never before experienced. My day however was not yet over with regard to memorable birding surprises. A dog-walk to Pershore Abbey between 19:45 and 20:00 hrs came up trumps with a real rare treat. I could not believe my eyes when fluttering around the Abbey tower like a giant moth in the floodlights, the Pershore Peregrine was having a terrible time landing on its usual roosting ledge whilst carrying prey. The falcon aborted landing many times, mostly on the west side of the Abbey, but eventually settled on the south side. After regularly monitoring this bird here since April 2005, I had never noted it using the south side. This is mainly due to most of our weather hitting this side of the Abbey making it unsuitable for roosting purposes. Tonight was purely out of necessity. At one point I noticed the Peregrine desperately clinging to the narrow ledge with one talon and supper (thought to be a Blackbird) dangling in space in the other claw. In my experience it is unusual for our Peregrine to bring food back to the Abbey, but when it does seems reluctant to use a more practical perch, of which there must be many, for plucking and feeding. The big question on my mind is how rare an observation is it to see a Peregrine feeding at night time?